From even the most basic description, No Man’s Sky is a hard game to wrap your head around. The moment that ‘18 quintillion planets’ number gets dropped in your lap, everything you thought you knew about gaming suddenly feels insufficient and irrelevant. 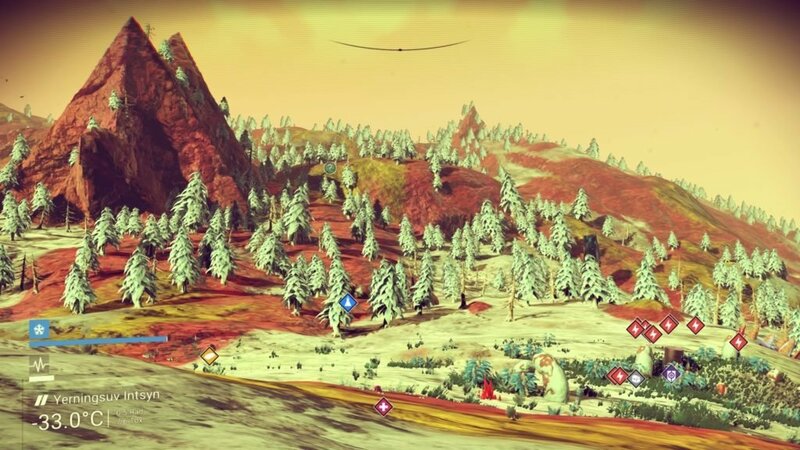 But if you can manage to look past that, you’ll find No Man’s Sky is a beautiful, open-ended survival game that makes phenomenal use of procedural generation in order to turn players into actual explorers. Despite this however, the title also struggles in the endgame to do credit to its lofty ambitions and one-of-a-kind universe. Before getting too deep into the math-created ocean that is No Man’s Sky, it’s worth pointing out that no, the latest from Hello Games is not the grand messiah of gaming. 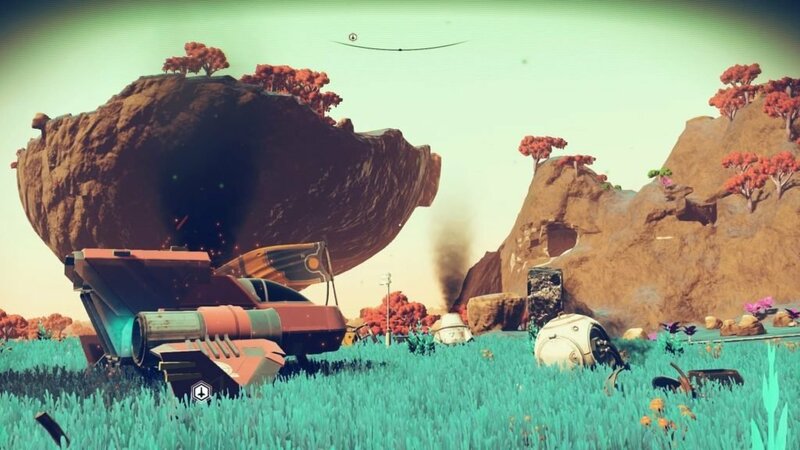 While the vast, procedurally generated universe is awe-inspiring, and perhaps a bit mind-melting, in scope, No Man’s Sky doesn’t reinvent the video game wheel. But it does use procedural generation to offer a unique gaming experience that would be impossible without it. In the same vein, it’s also not the next grand, action packed, sci-fi epic, like Mass Effect or Destiny. 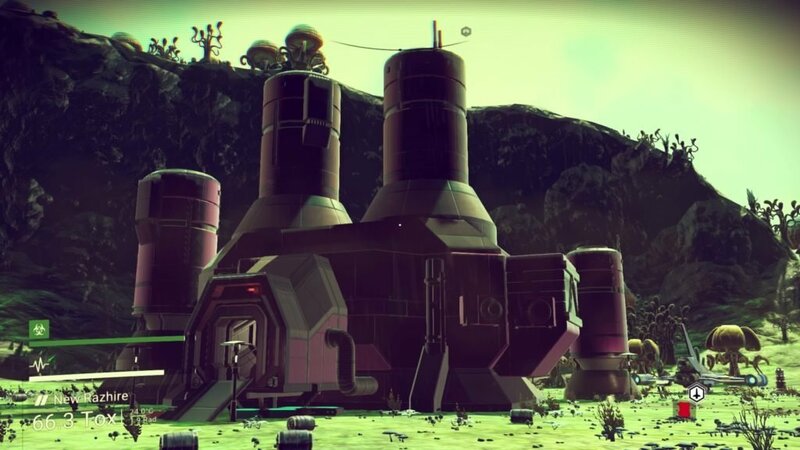 In many ways, No Man’s Sky is closer to Don’t Starve or Minecraft than to its sci-fi siblings. There is a story running through No Man’s Sky, but at its core it’s a survival game. It’s about collecting resources, crafting, managing your inventory, and so on and so forth. 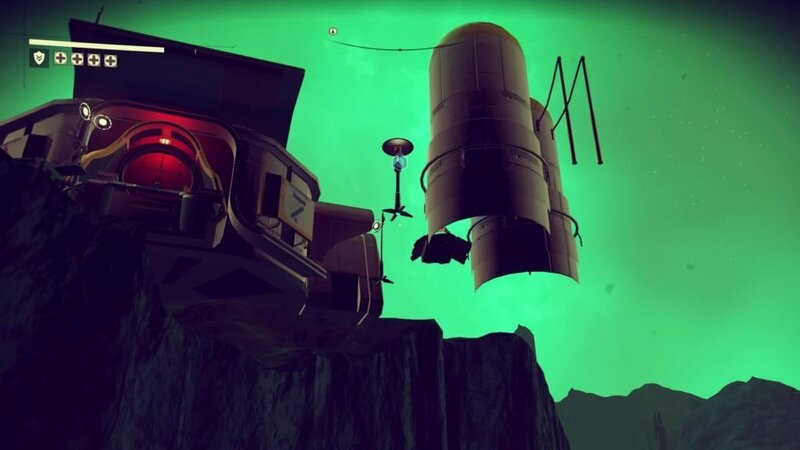 As No Man’s Sky opens, you find yourself stranded on a planet beside a crashed, damaged ship. Before going anywhere, you first must begin to explore and collect the resources required to fix your ship’s systems. And through that simple set of obstacles, the game quickly introduces players to a predominant portion of the title’s gameplay. You collect resources to help you finally take off and reach the next planet, then rinse and repeat as you explore your way through the galaxy. In doing so, there is a simple joy to seeing what is beyond that next hill, discovering a new point of interest, or stumbling across a huge deposit of that one resource you desperately need. Many gamers likely have little interest in such things, but for those that do, No Man’s Sky pulls you in without mercy until, before you know it, you’ve strayed so far that it is a full ten minute walk back to your ship. Planets, each procedurally generated, have different terrain, minerals, temperatures, plants, and animals. While one might be snow-covered and rocky, with only the most basic plant life, another might be nothing but luscious green fields, filled with hordes of strange beasts running here and there. And then a third might be blisteringly hot, its terrain a cracked mosaic of red and brown. Each has its own look, feel, and challenges, but all of them offer reasons to explore into the distance. 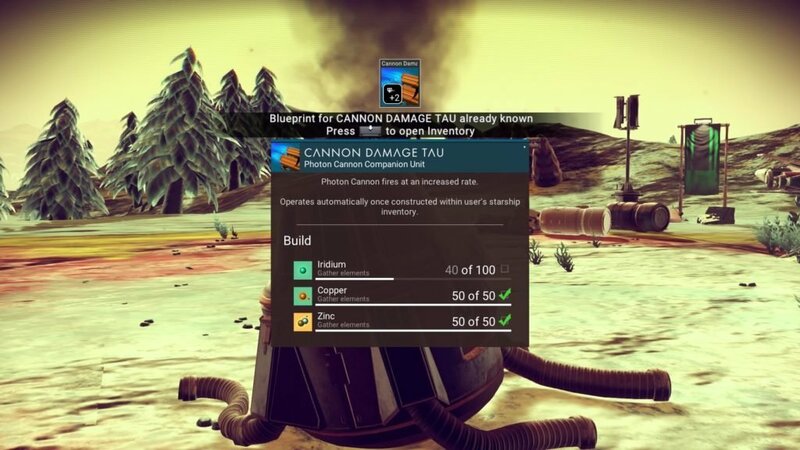 In what is possibly No Man’s Sky’s defining feature, every plant and animal you come across can be analyzed, renamed, and uploaded to the online community as your personal discovery. While only a handful of the plants I found during my travels ever ranked as particularly interesting, it is the array of animals that catch your eye and spark the imagination. 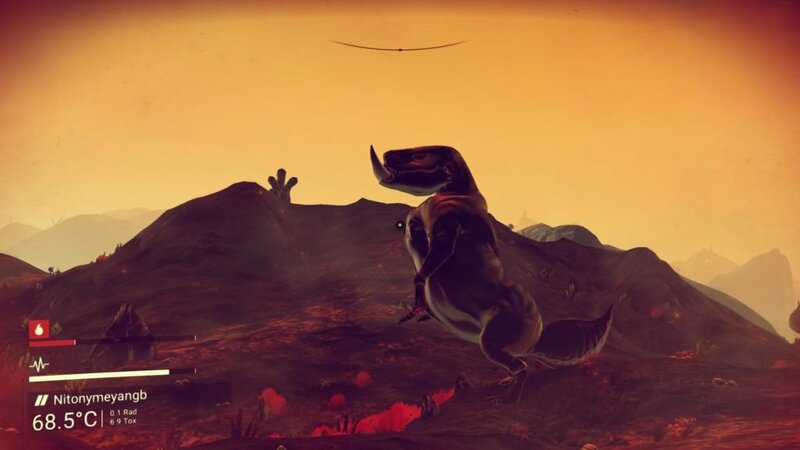 Be they scurrying little armadillo type creatures, towering beasts that could give T-Rex a run for its money, or even fish and birds, the procedural generation manages a wide range of oddities begging for names. While I’ll admit a majority of my chosen titles involve less-than-witty descriptors or just random words that seemed to fit well with that particular creature, there is a special feeling associated with having a lasting effect on the game world for others to see. If anyone ever comes across the hopping, dozen-eyed, blob monstrosity I discovered on my second planet for instance, I hope they will appreciate the fact its species is called Your Worst Nightmare. The ability to name and upload discoveries even includes landmarks on planets, the planets themselves, and entire star systems, giving you a sense of ownership to the solitary path you are carving through space. Other than animals and resources however, points of interest, green question marks that appear whenever the player sends out an ever-useful scanning pulse, also dot every planet. They range from simple landmarks and save points to alien outposts, abandoned buildings, secured manufacturing facilities, and even ancient temples. Though not particularly diverse, and each usually made up of only one or two buildings, the points of interest all offer up some reward for making the trip, playing into the crafting and resource management side of the game. Breaking into a manufacturing facility can grant you a new crafting blueprint, for example, while speaking with an alien at an outpost can net you resources, new technology, or even units, the game’s currency. There are three different alien empires found amongst the stars of No Man’s Sky, and each not only has their own space stations, cultures, and ships, but also their own languages. Finding ancient ruins in your travels, you can learn words for each of the strange, foreign tongues. Interactions with the alien races then involve actual dialogue in the alien language, with known words translated. Each conversation then becomes a small, but interesting, word game, requiring you to respond according to what little you may understand. Answering correctly leads to a nice reward and a higher standing with that individual race. That drive to better yourself and your equipment is the framework that bolsters the exploration themes of No Man’s Sky. Through these simple but effective systems, taking the time to collect relics for trade or learn new words all ties back into progression. Even uploading discoveries grants you units you can use to buy new ships and other upgrades. Everything you do and discover adds into that same slow burn of progression, and the game gives you more than enough freedom to decide what you want to focus on. Your character is comprised of three main components: your exo-suit, your ship, and your multi-tool (essentially a combination mining laser and gun). Each has a certain number of slots available. 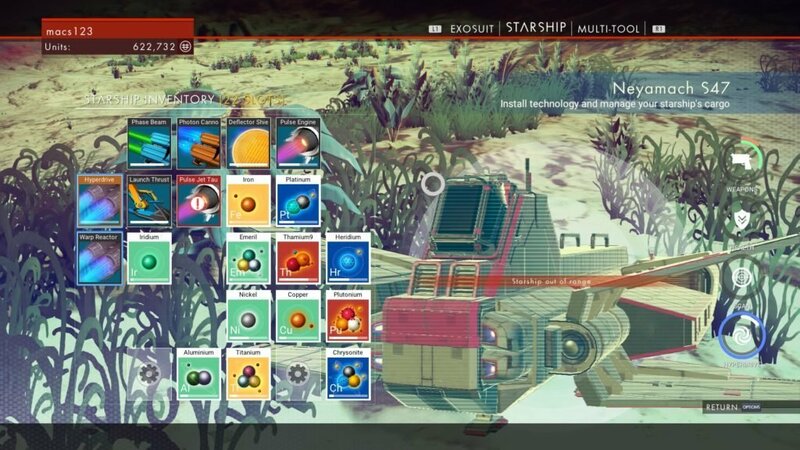 Though the multi-tool only allows upgrades, the slots for your exo-suit and ship double as upgrade slots and inventory slots. You can craft new upgrades to make your life support last longer, help you survive extreme temperatures, or even make your ship’s weapons stronger, but each upgrade takes away one more inventory slot. It becomes a complex balancing act that turns even basic upgraded functionality into a delightfully agonizing question of what you truly need most. When first starting out, the inventory and resource system at the heart of No Man’s Sky is overwhelming. 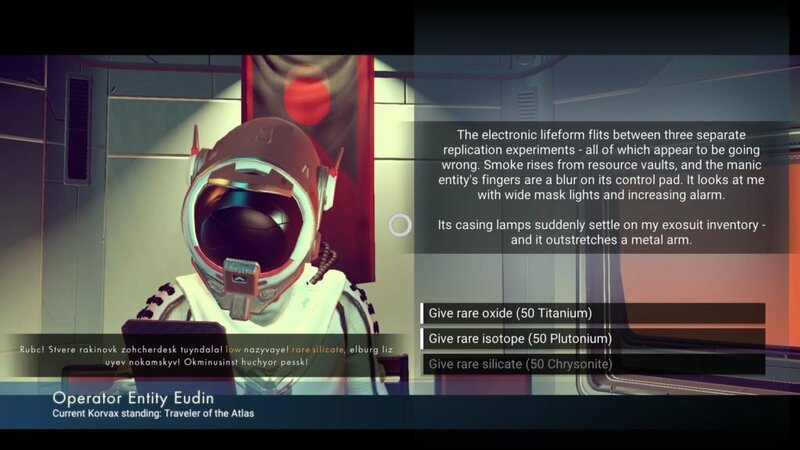 Hello Games has created an entire periodic table of elements in the game, some real, some made-up. Add in the numerous upgrades, crafting components, and blueprints, and it’s easy to feel like you’re sitting back in high-school science class, staring at one of the strangest exam questions ever. As a result, it’s then necessary to say again, No Man’s Sky is definitely not going for mass appeal. It’s not a game for everyone, but offers something few modern games manage. Sinking into, and embracing, that complexity is part of the fun. Every action in No Man’s Sky has a cost and a reward. If a particular spot on a planet doesn’t have the resources you are looking for, do you strike out with your multi-tool in hand? Or do you expend the resources it will take in order take off again and fly somewhere else? Likewise, you can choose to attack freighters and play aggressively, but then you have to deal with the automated, galaxy-wide security force, the sentinels. And speaking of combat, as said before, every upgrade to your ship’s weapons and defenses is then one less slot for your inventory or warp drive upgrades. It’s up to each player to decide what goals to pursue and to tailor their equipment and character for the given tasks. As the game stretches on however, the tight loop of exploration and progression begins to show its cracks. On the one hand there is the more excusable technical side of things. It should not be ignored that No Man’s Sky is a marvel. 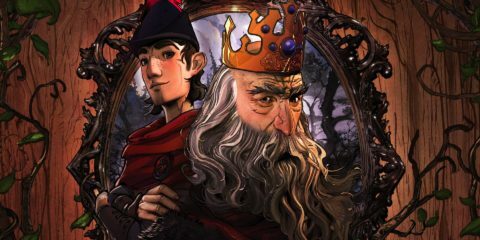 With even the game’s soundtrack procedurally generated, the ambition and scope of the game is impressive. That said, the price rears its head in environmental clipping, the rare floating outpost, and the server issues that have plagued the game since launch. Given how little of an effect being online actually has on the game, the server issues did nothing to detract from my personal experience of playing. In a similar way, the environmental clipping and floating buildings were there, but occasional enough to be good for a chuckle without compromising the game. Other than that, the title did crash once during my dozens of hours hopping from planet to planet. The far more pressing issues instead all revolve around the structure of No Man’s Sky’s endgame. Simply put, the progression system in No Man’s Sky grinds to a slow crawl surprisingly short of the game’s conclusion. While the beginning sees aliens and chests granting new technologies to upgrade and augment your character, the tail end sees aliens and chests granting the exact same ones, again and again. As a result, the player’s only reward is a quick message stating that particular technology is “already known.” With one already-known technology popping up after another, finding a new alien to interact with quickly loses its thrill. Couple this with some odd design choices, and the later half of the game begins to sag under its own weight. Rather vexing in the late game, there is the fact that ships don’t have trade-in value. Rightfully expensive, it can take a long time to save up for a new ship, complete with its flashy design and larger cargo hold. But, when buying a new ship, the game doesn’t take into account the value of the ship you already have, making it uncharacteristically difficult to buy the higher end models. Similarly, you can’t disable old waypoints you don’t want to follow any longer, leaving them as markers on your galactic map long after you have moved on. But nowhere is this unpolished final stretch more prevalent than in the game’s end goal itself. From the onset, No Man’s Sky tasks you with reaching the center of the galaxy. With such an expansive game, full of so much wonder and possibility, it’s not unreasonable to expect something impactful, or at least interesting from the center. Sadly, this isn’t the case, a disappointing fact for anyone wanting to work towards the center as a stated goal. Overall, the real drive of the game is the act of exploration, and the progression that it then plays into. Even having completed the game, I still look forward to returning to it and playing a bit longer in its massive sandbox, not because there is a specific goal to chase but simply because the game is a refreshing sci-fi jaunt unlike almost anything else out there. It’s clear to see why a mainstream audience will likely draw issue with the open-ended nature of No Man’s Sky. And it certainly isn’t a perfect game. But Hello Games has accomplished a feat that few modern developers manage and have created something that truly stands out and offers experiences not often seen in other titles. It’s a different kind of game, and is definitely special for it. Good. In general, worth picking up if you are a fan of the genre. No Man’s Sky doubles down on its promise of an exploration-focused game, using procedural generation to awe-inspiring effect. The wonder begins to drain the longer the game continues, but there is still fun to be had in the galaxy-sized sandbox. This game was reviewed on a PS4.